I have been lucky enough to have been impacted by non-profits since before I can remember. Yet, wildly enough, I never gave serious thought about working for one until my Junior year of college after a conversation with one of my mentors. This not only sparked a change in my major(yes, as a Junior in college), but also made me passionate about my school work. Beforehand, I was in nursing school for no other reason than people telling me I would make a great nurse. Yet, my new major of Health Promotion (a mixture of communication, public health, and non-profit management) was a perfect blend of my previous course work and let me still take a full Biology course load. Fast forward, I found a job that I was really excited about at a non-profit hospital, York Hospital. When I applied for the Drug-Free Communities grant position. This position taught me a lot about myself,grant work, and I gained first hand non-profit experience. Between the funding highs and lows, community outreach, grant writing, and of course managing a state contract (which at the time was on the cutting board quite often). I learned much more than occupation-related things though, I learned the value of a team and community who come together to solve problems, whether that was making recovery resources, hunger security, or tween seat belt safety. I also learned incredibly important tools about managing people thanks to several amazing women. When my supervisor told me she would support me looking for more sustainable jobs, knowing I also wanted to get back into New Hampshire, I luckily heard about the position open at the Partnership for a Drug-Free NH. While this position was a challenge, I happily accepted after an interesting and week-long interview process, it was also like drinking from a fire hose. My whole world was proving myself and the brand to everyone I met.This role in short, what was I love about working with nonprofits: the work made my heart warm. Of course, given this specific topic, it was grueling and defeating with every overdose that occurred, or family’s story I would hear. Yet, the emails, phone calls, and even facebook messages about how a brochure inspired a mom to talk to their family doctor about early signs of substance misuse, or inspired a teenage girl to understand her mom’s disease or ask for help when she saw her friend struggling. This list goes on, and that’s what is important. At the end of the day, non-profit politics can be, well… a lot. Between funding changes, mergers, communication breakdowns, state contracts, and more; I was always pushed to use my head, but also my heart. That is the thing… anyone who has worked with a nonprofit could list off so many negatives. But regardless,when we take a step back it is all worth it. Why? The work betters people lives, in many cases even saving them. The amazing people that non-profits serve (and employ) keep the optimism alive in us. The outcomes from the work, that is why. I used to keep a rose-colored notebook in my desk that I like to look back on, I referred to it when I needed to put my rose-colored glasses on. In it are pages upon pages of things that remind me of all the wonderful things that happen in a non-profit. As I move on to another nonprofit role, after thoughtfully turning down a few for-profit positions. I have had time to thoughtfully realize that the non-profit space is where I belong; so I will be purchasing a larger rose-colored notebook. It’s that time of year again! And while it may be too late for your Christmas tree decision making this year, I felt it necessary while on the top of my brain to write out the pros and cons of fake and real Christmas trees! First things first, we went to get our tree on December 1st. Some farms near us were flooded with the Seacoast, NH rains that we have had, but we ended up at a great local farm just 20 minutes down the road. Indian Hill Farm in South Hampton, NH. The first lesson: people tag their trees back in October, making tree pickings slim for folks like us who went in December. It was muddy and pretty scarce… compromise was the name of the game. I love fat and wide trees, while Matt likes them leaner and more what you might consider a picture-perfect tree. Now, I have had the tree in our house for a few days and I feel like this tree is a big responsibility… here are the cons. THE EXPERIENCE – As much as I have cons about trekking in the mud trying to find the right tree, there is something very magical about getting your tree and sawing it down to bring it home… I think that is the biggest pro that outweighs all the cons. Merry Christmas everyone! Enjoy your trees! As a non-profit executive director I would subscribe to blogs and pinterest hacks on taking care of yourself, these lists always made me chuckle. What could not having lunch at my desk, a ten minute walk, setting limits on work email, doing deep breathing REALLY do to my mental well-being? Spoiler alert, these are sanity savers for me too don’t get me wrong. When Matt and I got married, everyone told us to do the five love languages book and quiz. My love language is quality time and I started reflecting that this could also be my self-care love language. This led me to the following three components of my REAL self care. I don’t care who you are, how old you are, or what technology you had growing up… it’s nice to take a break. I used to think that if I wasn’t on my work email I was fine, but there are so many other distractions on social media, netflix binging, etc… (hey, that could be your self care too, but bare with me for a minute). Yet, when I go to the beach or my in-laws, or on vacation where there is limited service or wifi it is uncomfortable for the first few minutes, but everyone always comments how amazing it felt to just take a quick break. So, for me, heading to the beach with no service forces me to disconnect. Taking a run or going to gym might be a way for other people to disconnect, or simply turning your phone off at dinner with your loved ones. Whatever it is you do, disconnect and be mindful about it, and make sure you view it as a treat and not a punishment. My little slice of heaven on Boar’s Head walkway in North Hampton, NH. Great place to reflect, bullet journal, or just take in the sights. I love this question and I love asking this question. My heart is happy when I am breaking out my best dance moves in the kitchen while cleaning or cooking. While I am cuddled next to Matt or Ruckus, when I am hanging out with my mom, watching my brothers succeed, the look of my nails right after they get done (on the flip side, chipped nails drive me crazy), when I do to bed in a made bed, when I go for a walk with a friend, or try something new — all things that make my heart happy. Grab a piece of paper and write yours. One of mine was an easy fix. I am 2 miles from the beach, I wasn’t going at all when I was stressed out, because I wanted to get other things done. Yet, when I made time to go to the beach, I was so much more productive when I got home. This is a little bit more “traditional” self care. Do you fall asleep on the couch with all your make up on? Do you wake up with minutes to spare and start your day in a frenzy? These things matter. I was doing both for a period of time and boy did I not realize how bad it was for me until I stopped doing them. The simplest of things like washing my face felt like a chore, but now that I do that I feel so much better getting into bed. I’m hoping others can relate. My routines are still FAR from perfect, but making my bed in the morning and putting my clothes away at night before I go to bed have been such big game changers I too wonder what else I can do to keep improving. Well, that is my quick rant on self care, now that I really understand what it can do to my mind and body. Don’t get me wrong, I will be getting a massage in a few days and doing the golden standard of self care too, but my hearts a little happier now. I looked at big box retailers and their big price tags for cedar colored window boxes and felt defeated. We wanted 28″ window boxes and we could only adhear L brackets to make sure they stayed on, so I was feeling defeated. Hubby to the rescue, I had no idea how simple a project this could be! He went to work creating 28″ window boxes with a few planks he got at home depot and drilled a few holes in the bottom and prepped me to stain them. I used spray stain, yes a stain in a spray paint can in color cedar (Varathane brand), and then water sealed in for good measure with a Varathane exterior wood water sealer. The L brackets were the most expensive bringing this project to to a $60 total, but I will tell you now that I don’t just look at my flowers when I look at my house, but I look at the love that went into the window boxes too. Growing up in NH, you will find that most schools have a field trip to Mount Major. It’s a relatively easy hike, friendly for a beginning hiker, with “major” view payoff. I like to rank hikes based on this equation. How easy vs. view pay and average the difference. This is an easy 9, it’s hard enough to be rewarding, with fantastic foliage views. I went to Mount Major on October 21st, starting at 8:30, which I highly recommend. This is a VERY dog friendly hike. In fact, we were joking along the way that we only saw two children and around 100 dogs. Ruckus is an on-leash hiker until we get over our distraction issues (I’m sure he would follow a squirrel to the next state border). There are many off leash dogs, especially earlier in the morning, but we only met very friendly pups who were excited to enjoy a day out with their humans. If you decide to do in October make sure you bring lots of layers. Ruckus even had a jacket for the top, but the sun made the wind bearable while we took a few pictures and took in the views. I recently went to a Stay Work Play event, the organizations focuses on keeping under 40 year-olds in NH to Stay, Work, and Play. Living on the seacoast, it’s easy to do all of those things, but NH really does have so much more to offer… it was great to get to the Lakes Region in the Fall to enjoy what New Hampshire has to offer (hint: it’s a lot). I love this last photo of Ruckus with his Aunt Sarah, very bored that we are taking so long. I have always had a hard time decorating for Halloween, it’s so similar to Fall decorations that can last until Christmas (eeeeek!) decorating. But, this year in a new house I tried some DIY things, including chalkboard art. I perused Pinterest and had a fun time adding a fun touch to my mud room. The supplies I used were a large hobby lobby chalkboard that I painted the frame. I bought it for my wedding, and have since used it for many chalk projects. I also love the Michael’s chalk pens or amazon. Here is the finished project! For $15 I have a piece I can redo for every holiday. Raise your hand if you have watched Hocus Pocus. I know my hand is raised proudly, which why I had to visit Salem, Massachusetts and explore where the film was shot. IT is also appropriately nicknames Witch City, with taxi’s adorned with broomsticks on the side and the town bicycle shop even named “Wicked Cycles” with a witch hat logo. It is the place to be for any fan of halloween. In fact, while I was there I learned later that HERMIONE GRANGER was there… yes, Emma Watson is even a fan of learning more about witch craft. Or, perhaps she was there to perfect some spells. I hadn’t been to Salem since a field trip back in Elementary school, so I enlisted my best friend Sarah and Helena and explored Salem. When we first arrived an older man gave us a parking tip that if you park in the MBTA garage all day parking is $2 and a quick walk to Essex St. where all the tents are set up. We walked into a lot of shops, many who had lines out the door just to get in. One of my favorites was the wand store, which was almost just as great as the Universal Studios wand store in Harry Potter World. We went to lunch at Rockfellas, great food and even better they had Downeast Pumpkin Cider on draft (if you know, you know). After lunch, we went and took pictures with a few of the many set up along the streets, they’ll remind you they work for tips. Got some great insta shots. I think I will go back and do some more haunted things, such as the haunted candle lit stroll through Salem. We wrapped up by going to the Witch History Museum, which was fun, but wanted to be around more mystical places. It was well worth the quick 45 minute drive down from the Seacoast of New Hampshire to visit. Matt and I are already planning a night, which I know will be WAY busier, to go to some creeeeepy places and get spooked before Halloween arrives. Any more ideas from fun places to go to during this time of year? Let me know! 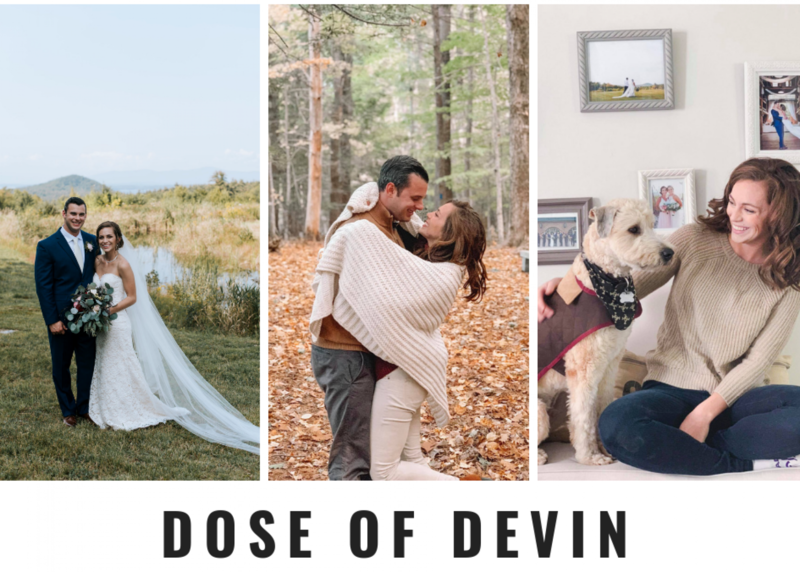 Welcome to my blog about thriving, not just surviving: being a millennial newlywed, owning a home, working in a non-profit, and trying to be a DIY queen. Stick around, you never know what is next!